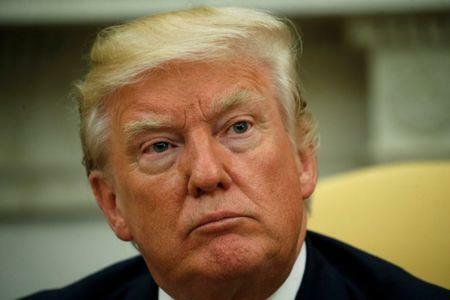 WASHINGTON (Reuters) - A midnight tweet by Donald Trump unleashed a wave of sometimes mocking speculation by Internet users wondering what the U.S. president meant by writing "covfefe" in an apparently unfinished Twitter post that lingered online for hours. The post, since deleted, was followed by a Trump message at 6:09 a.m. 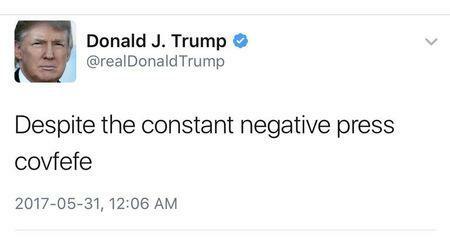 ET that sought to put a playful tone on the misfire, saying, "Who can figure out the true meaning of "covfefe" ??? Enjoy!" The original message, which seemed to have been the start of a Trump complaint about media coverage, soon became a top trend on Twitter. Some users sought clarification from dictionary company Merriam-Webster. They did not get a definition but did draw a response. "Wakes up. Checks Twitter... Uh.... Lookups fo(r)... Regrets checking Twitter. Goes back to bed," @MerriamWebster wrote after Trump's first tweet ignited a slew of possible definitions and jokes, as well as defenses of the president. "Covfefe" also made its way into the Urban Dictionary, a website that collates online word submissions. Asked at a briefing whether people should be concerned that the president sent out an incoherent Tweet and left it up for hours, White House spokesman Sean Spicer said: "No." "I think the president and a small group of people know exactly what he meant," Spicer added when asked why the Tweet remained uncorrected for so long on Trump's personal @realDonaldTrump account. Democratic U.S. Senator Al Franken, in a CNN interview on Wednesday morning, joked: "A covfefe is a Yiddish term for 'I got to go to bed now,'" dismissing the tweet as a late-night error. Conservative commentator and radio show host Laura Ingraham tweeted in response to Trump's guess-the-meaning post that, "It's so bad--the collusion b/t (between) the Dems & the press, the establ(ishment) vs the ppl(people), that we needed a new word to describe it all. #Covfefe!" Trump's "covfefe" message drew renewed attention to his prolific Twitter habit. The Republican president has said using Twitter helps him speak directly to Americans and bypass the media, which he has long criticized. When asked in the past about other Trump tweets, White House spokesman Sean Spicer has said the posts speak for themselves. Trump was relatively quiet on Twitter during a nine-day trip to Middle East and Europe but resumed tweet storms after returning home on Saturday. 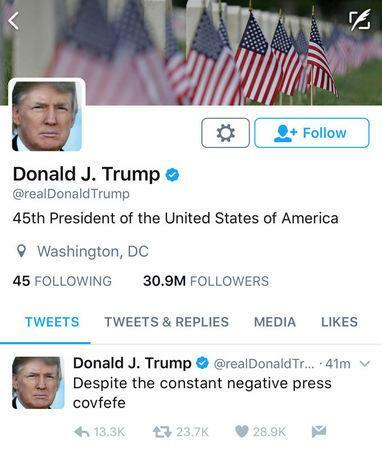 Moments after tweeting about the "meaning of covfefe" on Wednesday, he turned to Twitter again to blast the Russia probes and address a series of other issues.